Save £100 with our New permanently reduced price for 2019! By undertaking the IOSH Working Safely course you will learn the foundations for good working practices in the workplace – to ensure yourself and others are kept safe. This course sets the bar for those wanting to progress further in health and safety as a career. The price of this IOSH Working Safely course is all inclusive without any Hidden Fees! What course should I study next? Courses which are often recommended to help boost personal development after completing the IOSH Working Safely are the IOSH Managing Safely, NEBOSH National General Certificate and the NEBOSH International General Certificate. Recommended: Suitable for all employees within the organisation and gives a basic introduction to health and safety. Progression: IOSH Managing Safely, NEBOSH General Certificate. An adequate understanding of the English language required by students who undertake study for the NEBOSH National General Certificate must be to such degree that they can both understand and articulate the key concepts contained within the course syllabus. To provide a basic introduction to health and safety. To explain why health and safety is important. The working safely course is a 1-day awareness level course and should take approximately 8 hours of study. The student is assessed in two sections of the final assessment. They have 2 chances within a 6 month period to do this- if not they will be required to re-register. Interactive Examination – 33 questions where you must select the correct answer. Hazard Spotting Assessment – 4 scenarios where you must provide responses to 3 questions within each scenario. The IOSH Working Safely course is great for those who need to be flexible when learning – as long as it is completed within the 6 month period, it does not matter how quickly or slowly the student completes the course. This is a closed book exam and therefore any indication of malpractice may be reported. Results are then generated by the course provider. Let’s see what resources, tools and technologies are included within this IOSH Working Safely eLearning course. eLearning is an online classroom, which can be accessed, anytime anywhere, fully supported by SHEilds team of accredited Tutors in the UK. SHEilds’ design team have created the course with custom graphics and animations to help teach in our globally recognized way. Why should I study an IOSH Working Safely? Many people understand that Health and Safety is a requirement to ensure the safety of employees. The Working Safely course ensures that every employee understands the procedures that must be followed to reduce the risk and eliminate accidents. It is attractive to Employers and for those looking to start a Health and Safety Career as it lays the foundations for a higher level Health and Safety Qualification. Ready to begin your journey to become a health and safety professional? Interested? Ask us a question before you buy. If you’d rather call to discuss your options and speak to us, Please call! 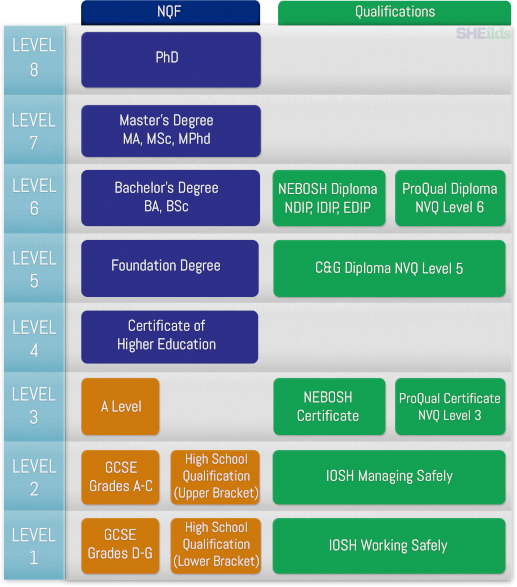 We have created a chart to show the NQF level of each SHEilds Qualification. The Working Safely is an entry level qualification to Health and Safety.